Yang,Ming-Heng, the Deputy PET Bottling Plant Chief of Sunnano Biotech Inc., (From the Right 1) shared Sunnano'sWater Footprint experiences at the forum. In recent years, Water Footprint Assessment has been promoted as an international means of water conservation. 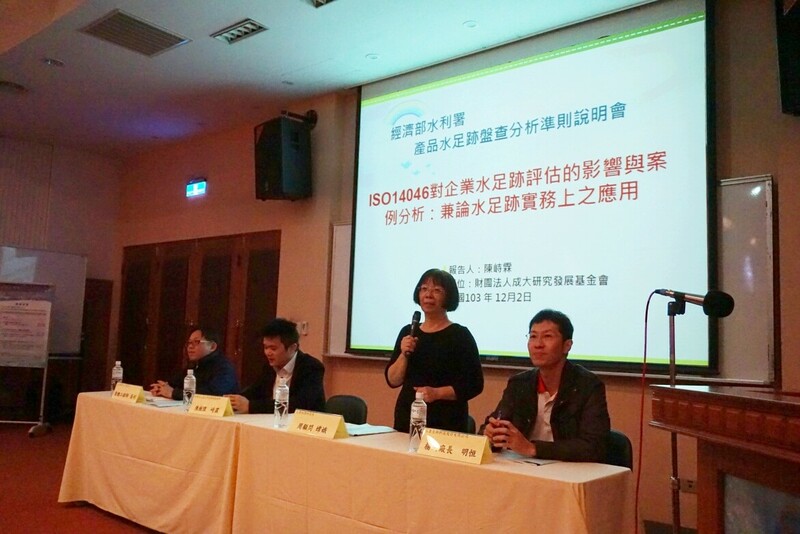 Taiwan passed ISO 14046:2014 in July of 2014. Sunnano Biotech Inc., was recognized by the Water Resources Agency, and as the first FMCG enterprise to be certified in Asia. In order to improve enterprises’ water resources management in Taiwan, the Water Resources Agency, held a forum to promote the Water Footprint Assessment on December 5th at the Tamkang University. Yang,Ming-Heng, the Deputy PET Bottling Plant Chief of Sunnano Biotech Inc., was invited to attend the forum to share Sunnano’s Water Footprint experiences, with Lai, Bo-Xun, the Vice Chairman of Water Resources Agency, Zhou, Chang-E, the Consultant of Taiwan Research Institute, Lin, Wen-Hua, the Assistant Manager of the British Standards Institution, Chen, Zhi-Lin, the Representative of National Cheng Kung University and Ye, Chang-Li, the Chief of Engineer of Westin Taipei Hotel. Yang, Ming-Heng illustrated Sunnano’s experience of Water Footprint Assessment at the forum. The Water Footprint assessment encompassed four phases; one, setting objective and range, Water Footprint calculation, sustaining assessment, and finally, the effective result. Yang suggested that prior to the project, any company intends to follow suit should strengthen the management allocation. Sunnano Biotech Inc. hopes to encourage the industry to practice the Water Footprint project, and make great efforts in the Earth's environmental protection.